Average Weight	: 11 -12 lbs. Developed in East Anglia, England, the Norfolk and Norwich Terriers used to be the same breed with two different ear types; both were referred to as the Norwich Terrier. The English were the first to separate them in 1964. In 1979 the AKC officially deemed them as separate breeds, the Norwich having small, perked ears and the Norfolk with dropped ears. Another slight difference is the Norfolks are angular in shape and the Norwich Terriers are more round. The dogs were used as barnyard ratters and to bolt foxes that had gone to ground during a fox hunt. Their small size allowed them to get in and out of fox dens easily. After the foxes were flushed from their dens, hunters on horseback would resume the chase with their hounds. Ridding barns of rats and vermin require one to not only be agile but ever vigilant and plucky. Such is the case for the Norfolk terrier. Although hardly ever used for its original intention, the breed has never lost its perky and fearless outlook. While having a very up front attitude, these terriers are considered to have the softest of temperaments. Hardly the type to be outright aggressive, they thrive on human attention and love to be included. In the field, they worked as pack animals and therefore still want to be involved, making them great companions for households with children or older persons who can shower them with affection. Still akin to their instincts, the Norfolk terrier loves to play fetch and chase after small objects. Barking and digging are natural for them, although not commonly to a destructive end. The uneventful life goes against the very nature of this working class breed. They will do best living indoors but will require plenty of activity. In fact, they are likely to take in all the activity a 10 to 12 pound dog can handle. This may not amount to much for the average human being; however activities should center on being interactive as one of the worst challenges for this breed is to be ignored. In general, small breeds escape the Health worries that many larger dog breeds come up against such as hip dysplasia. 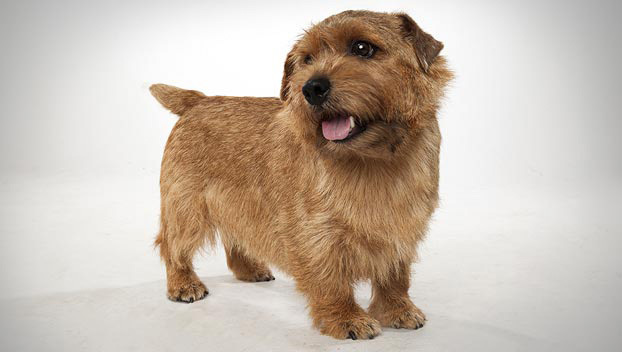 Luckily, this is also the case with the Norfolk Terrier. While they should be screened regularly for any Health Problems, when there is a concern the most common genetic disorders run along the lines of MVD, mitral valve heart disease, Epilepsy and sometimes breathing problems. As with all breeds, table scraps should be avoided in order to maintain a happy, healthy weight. Grooming the Norfolk terrier is simple and easy however the breed does require grooming every other day to prevent knotting and tangling of the longer hairs on the bottom side of the body. They are average shedders and will have a heavier shed in the spring and fall, requiring extra grooming to keep the coat in good condition as well as to prevent excessive dog hairs left all over the furniture and carpets. There are a few basic tools required for grooming the Norfolk Terrier. A stiff bristle brush, slicker brush and a wide toothed grooming comb are the basics that are needed. Start by using the stiff bristle brush or wide toothed comb to brush the hair starting at the base of the neck and proceeding down the body. Always brush in the direction of hair growth, taking care to stop and detangle any areas that are knotted. The comb can be used first on the longer fringe hairs or furnishing along the back of the front and back legs as well as across the line of the stomach. Typically with daily or every other day grooming the process should only take a few minutes and will a great way to spend time with the dog. In addition to grooming the coat is it important to inspect the nails for any signs or chipping or breaking, and trim them regularly as needed. Use a good quality guillotene style dog nail trimmer or set of noticed scissors. Never use human nail trimmers as this will shatter the dogs nail. Check the teeth and use a finger sleeve or dog toothbrush to brush the Norfolk terriers teeth on a regular basis. This will help avoid costly descaling that has to be done by a vet plus it will ensure that your dog has excellent tooth retention and dental health even into their senior years. The Norfolk terrier is a remarkable breed of dog that enjoys a high level of exercise but can also tolerate a day or two of relaxation every now and again. They are eager to go out for a walk, run or a ride in the car to the park or for a hike. Many owners of Norfolk terriers enter these small dogs in various types of events as a form of both mental and physical exercise for the dogs. Two such events are flat racing and flyball. Flat racing for the Norfolk terrier involves a short course with no hurdles or obstacles while flyball relays consist of a dog jumping over at least four hurdles, then activating a flyball box pedal which shoots off a ball that must be retrieved. Upon recovering the ball, the dog must then turn around and jump back over the hurdles and make it to the finish line. Lure coursing is where terriers chase after some form of artificial lure, such as a rat or rabbit. An earthdog trial is a go-to-ground type of exercise in which a Norfolk terrier will run through the course of a small, typically above ground wooden tunnel system while scenting a small rodent, such as a rat. The dog must then find his or her way to the rat, which is safely kept in a cage at all times, and either bark or scratch indicating they have found their quarry's location. Although there are time limits set for completion, this is a noncompetitive activity where owners can gauge their terrier's capacity for hunting. Remember that exercise doesn't have to be through competition. These dogs will enjoy a simple game of fetch, a romp in the yard with the kids or even to go on a nice stroll after dinner. They are great dogs for joggers and have boundless energy for those families with younger children. It may be necessary to be prepared to work on housebreaking at some length with this type of breed, as they have a tendency to be somewhat independent in mind. One will need firm, consistent boundaries with a dependable routine in place. A training routine that is consistent and involves interaction with loads of praise is a perfect motivator. In the meanwhile, loving attention as they do, this terrier breed can have episodes of bossiness or jealousy but this is rarely a predominant characteristic. A Norfolk terrier is quite self confident and habitually does very well with other dogs, at times all too eager to have a companion in which to take on the world. The Norfolk terrier does quite well walking with a lead and, for safety's sake, it is recommended that one keep this breed on a leash at all times unless enclosed in a fenced area. It is not uncommon for instinct to take over the minute a Norfolk terrier spies a squirrel or some other small prey and chase off after it with almost reckless abandon. Households where small pets such as gerbils, guinea pigs or even rabbits share their space with a Norfolk terrier need to be kept in cages at all times, preferably in separate rooms. Since Norfolk terriers are very intelligent dogs, they will often learn bad habits quickly, just as they will learn positive habits. Consistent training and changing training routines frequently is critical with the breed to avoid boredom and non-compliance issues. As with all terriers, the breed does best with positive rewards and lots of praise for a job well done. Ignoring the dog for bad behavior, especially when the Norfolk is learning, is an excellent method for eliminating the bad behavior. Yelling at or punishing the terrier will not achieve the desired results, rather you will damage the bond that the dog has formed with you and can lead to more aggressive type behaviors and lack of response to commands.